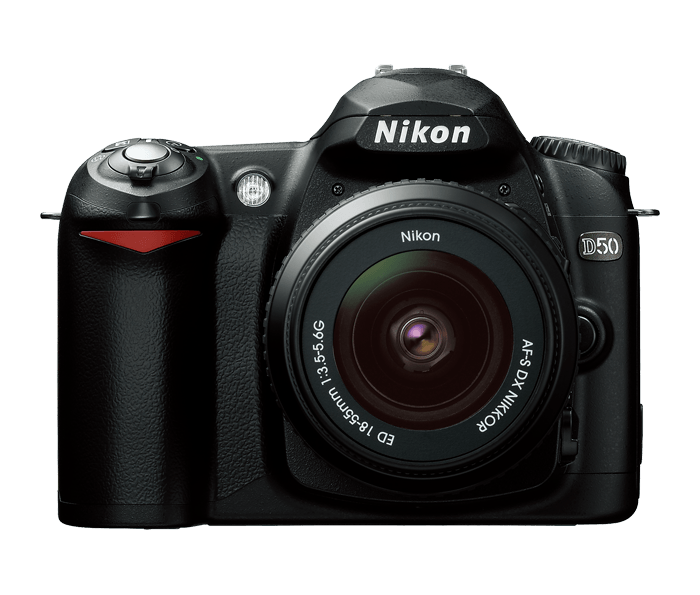 High performance 6.1 Effective Megapixel Nikon DX Format CCD Image Sensor: The D50 delivers vivid colour and sharp detail with high resolution for great pictures and enlargements. High-Quality Nikkor Optics including NEW Compact and Lightweight AF-S DX Zoom-Nikkor 18-55mm f/3.5-5.6G ED Lens: The new D50 offers seamless compatibility with Nikon's extensive family of high-performance AF Nikkor lenses, as well as the expanding family of DX Nikkor lenses, providing superb colour reproduction, razor-sharp image clarity and fast and accurate autofocus performance. 7 Digital Vari-Programs: The next evolution of Nikon's scene-optimized Digital Vari-Program modes produces great results for the intended shot, while freeing you to concentrate on the moment. New Child mode makes it easier to take memorable pictures of the children with the right amount of vivid colour and contrast straight from the camera. Choose from Auto, Portrait, Landscape, Child, Close Up, Sports, or Night Portrait. High-performance digital processing: employs exclusive Nikon technology to render vivid colour and clear details with all the speed necessary to freely capture those precious moments as they unfold. 3D Colour Matrix Metering II: The D50 incorporates a 420-pixel RGB sensor for accurate exposure control in all types of lighting situations. By comparing the scene to a built-in database of various lighting patterns, the camera's light meter can accurately produce your best pictures ever.